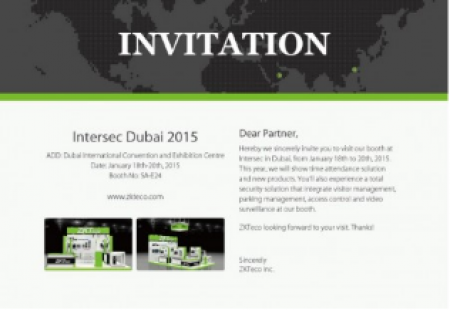 We sincerely invite you to visit our booth at GITEX Technology Week in Dubai, from October 18th - 22nd, 2015. This year, we will show our latest time management products, solutions, and management platforms. You'll have a brand new experience with our presentation of security solution which integrates visitor management, parking management, channel control and access control. We are looking forward to your visit. Thanks!